The NANOS Young Neuro-ophthalmologist Committee (we call ourselves YONOs for short! ), wants to welcome you to our portal and let you in on all that the North American Neuro-Ophthalmology Society (NANOS), the premier professional, educational and research organization for neuro-ophthalmology, has to offer for those interested in pursuing a career in our sub-specialty. 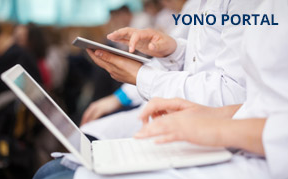 YONO was established in 2012 in an effort to meet the needs of trainees and neuro-ophthalmologists in their first five years in practice. Take a look around our portal-- it has been specifically designed to help you navigate your way into a career in neuro-ophthalmology. Below are audio links from YONOs, providing you some their advice and tips along the way. If you are not already a member, we encourage you to consider becoming a member of NANOS, at exclusive discounted rates for trainees. View the ‘Join NANOS’ page which highlights the benefits and details for applying for NANOS membership! Please do not hesitate to contact the NANOS Executive Office at info@nanosweb.org with any questions about YONO and NANOS.